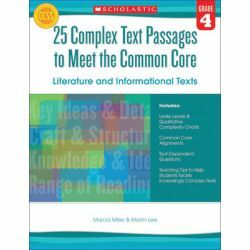 Literature and Informational Texts A collection of 25 leveled passages with text-dependent comprehension questions that help students tackle increasingly complex texts and provide the academic rigor called for by the Common Core State Standards. The lessons include teaching tips that target the challenges students will encounter in the passage and provide text-complexity information— quantitative (Lexile level), qualitative, and reader and task considerations—to help teachers meet the needs of their class. 80 pages.